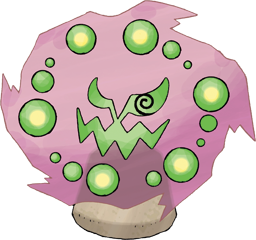 Spiritomb does not evolve/is not evolved into. X A Pokémon that was formed by 108 spirits. It is bound to a fissure in an odd keystone. X Ein Pokémon, das aus 108 Geistern besteht. Es ist an einen Spalt in einem mysteriösen Stein gebunden. X Un Pokémon composé de 108 esprits. Il provient d’une fissure dans une clé de voûte étrange. X Se formó a partir de 108 espíritus. Está unido a la fisura de una piedra angular mística. X Pokémon formato da 108 spiriti. È stato imprigionato nella fessura di una Roccianima. X 108개의 영혼이 모여서 태어난 포켓몬이다. 쐐기돌의 균열과 연결되어 있다. Y It was bound to a fissure in an odd keystone as punishment for misdeeds 500 years ago. Y Es wurde in einen Spalt eines Steins gebannt, als Sühne für Untaten, die es vor 500 Jahren begangen hatte. Y Il fut emprisonné dans la fissure d’une clé de voûte étrange en guise de punition il y a 500 ans. Y Como castigo por una fechoría 500 años atrás, está unido a la fisura de una piedra angular mística. Y 500 anni fa fu imprigionato nella fessura di una Roccianima come punizione. Y 500년 전에 나쁜 짓을 했기 때문에 쐐기돌의 균열에 몸이 연결되어 갇혀 버렸다. Omega Ruby It was bound to a fissure in an odd keystone as punishment for misdeeds 500 years ago. Omega Ruby Es wurde in einen Spalt eines Steins gebannt, als Sühne für Untaten, die es vor 500 Jahren begangen hatte. Omega Ruby Il fut emprisonné dans la fissure d’une clé de voûte étrange en guise de punition il y a 500 ans. Omega Ruby Como castigo por una fechoría 500 años atrás, está unido a la fisura de una piedra angular mística. Omega Ruby 500 anni fa fu imprigionato nella fessura di una Roccianima come punizione. Omega Ruby 500년 전에 나쁜 짓을 했기 때문에 쐐기돌의 균열에 몸이 연결되어 갇혀 버렸다. 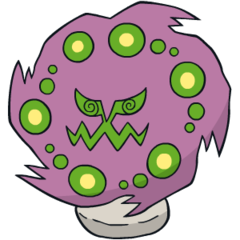 Alpha Sapphire A Pokémon that was formed by 108 spirits. It is bound to a fissure in an odd keystone. Alpha Sapphire Ein Pokémon, das aus 108 Geistern besteht. Es ist an einen Spalt in einem mysteriösen Stein gebunden. Alpha Sapphire Un Pokémon composé de 108 esprits. Il provient d’une fissure dans une clé de voûte étrange. Alpha Sapphire Se formó a partir de 108 espíritus. Está unido a la fisura de una piedra angular mística. Alpha Sapphire Pokémon formato da 108 spiriti. È stato imprigionato nella fessura di una Roccianima. Alpha Sapphire 108개의 영혼이 모여서 태어난 포켓몬이다. 쐐기돌의 균열과 연결되어 있다. Diamond A Pokémon born from the assembly of 108 spirits. It is sealed in the cracks of the Crucial Stone. Pearl 500 years ago, it was sealed into the cracks of the Crucial Stone due to the bad things it did. Platinum Its constant mischief and misdeeds resulted in it being bound to an Odd Keystone by a mysterious spell. HeartGold It was formed by uniting 108 spirits. It has been bound to the Odd Keystone to keep it from doing any mischief. SoulSilver It was formed by uniting 108 spirits. It has been bound to the Odd Keystone to keep it from doing any mischief. Black Its constant mischief and misdeeds resulted in it being bound to an Odd Keystone by a mysterious spell. White Its constant mischief and misdeeds resulted in it being bound to an Odd Keystone by a mysterious spell. Black 2 Its constant mischief and misdeeds resulted in it being bound to an Odd Keystone by a mysterious spell. White 2 Its constant mischief and misdeeds resulted in it being bound to an Odd Keystone by a mysterious spell.